Lambrusco Spritz garnished with an orange slice. Photo by Giada Paoloni. One of our favorite ways to start a summer evening is with an Aperol spritz in hand. Tarallucci e Vino's beverage director, Lorenzo Baricca, introduces us to his new take on the classic Italian cocktail. As a native of Emilia-Romagna, I grew up drinking Lambrusco. At in New York City, I thought it might be a nice idea to riff on the Aperol spritz with my native beverage. After several attempts, I found that ’s Lambrusco Barghi L’Incontro worked beautifully. We are the only restaurant serving this Lambrusco in the United States and it is truly the best! If you can’t find it, try Lambrusco di Sorbara, which is light and dry and also works very well. 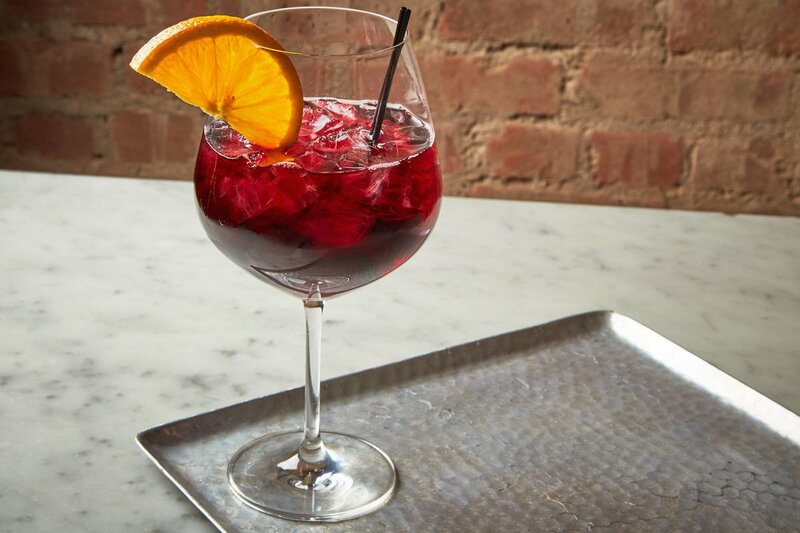 In a large glass, add a spoonful of ice, Lambrusco, Aperol, and a splash of soda. Garnish with an orange slice and enjoy! Who Wants the Recipe for New York City's Favorite Cambodian Sandwich? Lorenzo is the Wine & Beverage Director at . You can follow him on and for cocktail recipes and wine pairings. He travels for the love of discovering new wines and its producers.